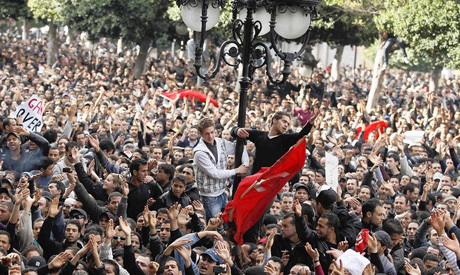 Tunisian's gather after Ben Ali leaves, January 15, 2011, (Reuters). One of Tunisia's most prominent political parties launched its campaign on Monday ahead of the country's first free election after decades of autocratic rule. Maya Jbiri, the head of the center-left Progressive Democratic Party told journalists that thousands of the party's activists were heading to the countryside to educate the people about the nation's new democracy. Tunisia on Jan. 14 overthrew long time dictator Zine El Abidine Ben Ali, ending decades of his iron-fisted rule and ushering in a new era of political freedom as well as uncertainty. Tunisians in October will elect members of an assembly that will write a new constitution. The country for now is being ruled by a caretaker government and has been rocked by continuing unrest raising fears that its transition to a democracy won't succeed. "The responsibility for the success of this transitional period rests on all the parties and the elements of civil society," said Jbiri, the first woman to lead a political party in Tunisia. Almost 100 political parties have appeared since the end of Ben Ali's repressive regime, though most have little organization and remain unknown to the public at large. The PDP is one of the best known and most organized parties in the country — after the Islamist Ennahda. The leftist party's efforts come after similar ones by Ennahda, which was brutally repressed by the previous regime but has since made a dramatic comeback, staging rallies throughout this country of 10 million. Led by Rachid Ghannouchi, Ennahda is one of the most progressive Islamist groups in the Arab world, but its rise has raised fears among many in Tunisia, which has one of the more secular societies in the Middle East. The party pulled out of the commission preparing for the next elections, in part because Ghannouchi said some members were pursuing a vendetta against Ennahda and trying to demonize it. On June 26, Tunisians were shocked when about 100 ultraconservative Muslims known as Salafis, attacked a movie theater showing a controversial movie with secular themes, wounding a number of people inside. On Monday, a court convicted the former Tunisian president Zine El Abidine Ben Ali of smuggling drugs, guns and archaeological artifacts and sentenced him to 15½ years in prison in the latest trial in absentia of the deposed autocrat. Ben Ali will also be fined $72,000. The verdict follows a trial two weeks ago in which he and his wife each received sentences of 35 years in prison and $64 million in fines for embezzlement and other charges. Authorities say another 91 charges remain just for the civil courts.